Dig in to the many great places to eat and drink near DC’s convention center. The Walter E. Washington Convention Center is one of the top meetings venues in the nation’s capital. Fortunately for conventioneers, it also happens to be surrounded by one of the city’s fastest growing restaurant scenes. 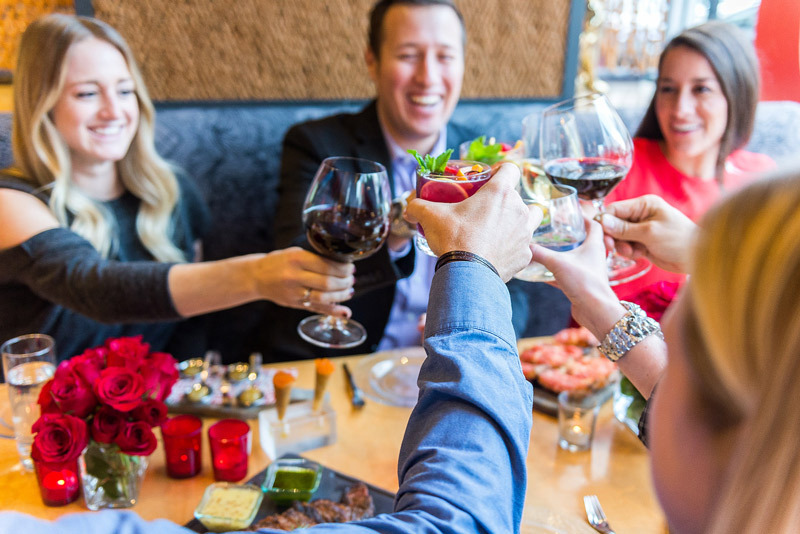 We’ve compiled some of the top dining hot spots in the neighborhood below to make any meeting you have at the convention center that much more appetizing. If you're looking for large group and private dining options as well, we've got you covered. Hungry for more? Take a look at our handy Good Eats Food Map featuring 40+ options nearby, including where to get breakfast, group-friendly and Michelin-starred restaurants and much more. This Italian-American eatery is an ideal destination if you’re craving artisanal pizzas from a deck oven. The rustic space also serves up antipasti and a selection of 50 wines. Chef Mike Friedman is also responsible for The Red Hen, another acclaimed, Italian-style restaurant in the neighborhood. All-Purpose is open for lunch and dinner. Conveniently located at the convention center, the Unconventional Diner is far from your standard all-day diner. The modern space includes a cafe area for on-the-go breakfast pastries and sandwiches, while dinner features unique twists on your favorites: Meatloaf is dressed in a sriracha glaze and morel gravy, while cheeseburgers are made with wagyu beef and topped with tomato chutney and dijonnaise. 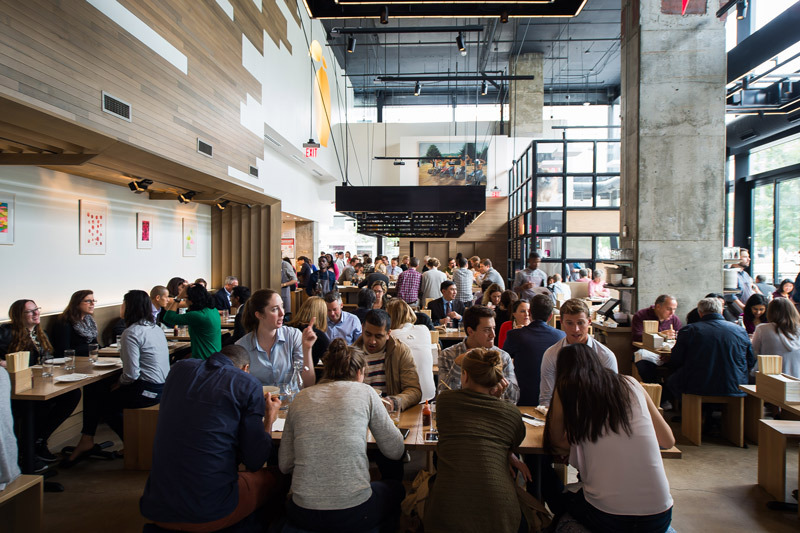 Think you know Momofuku? Celebrity chef and Momofuku founder David Chang would beg to differ. After more than two years as a CityCenterDC staple, Chang decided it was time to revamp the popular spot. The first move was to bring in Maryland-raised Tae Strain as executive chef and blow up the menu to focus on native Mid-Atlantic ingredients. Ramen and buns? Out. What’s in? Bing, a grilled Chinese flatbread served seven different ways, a new lineup of dumplings and family-style dishes that include a whole rotisserie chicken with chicken fat basmati rice and cilantro yogurt. DC’s premier southern Mexican restaurant sports a mezcal bar that is sure to add some punch to your meal. With an eye on the past, dishes and drinks are infused with tradition but also showcase innovation. The sophisticated locale also features seven different kinds of mole, a type of sauce used throughout Mexican cuisine. RPM Italian is Giuiliana and Bill Rancic’s take on Italian cuisine, featured prominently in Mt. Vernon Square. The sleek setting often welcomes celebrities, and it’s easy to see why: menu highlights include slow roasted meats, wild fish, over a dozen pastas and signature cocktails. Located on Blagden Alley in Shaw, this much-acclaimed restaurant has been abuzz since it opened. The Dabney earned a Michelin star for a number of reasons, but several of them follow: its 10-foot wood-burning open hearth, its dedication to Mid-Atlantic cuisine and dishes that breathe new life into recipes inspired by historical 19th-century cookbooks. 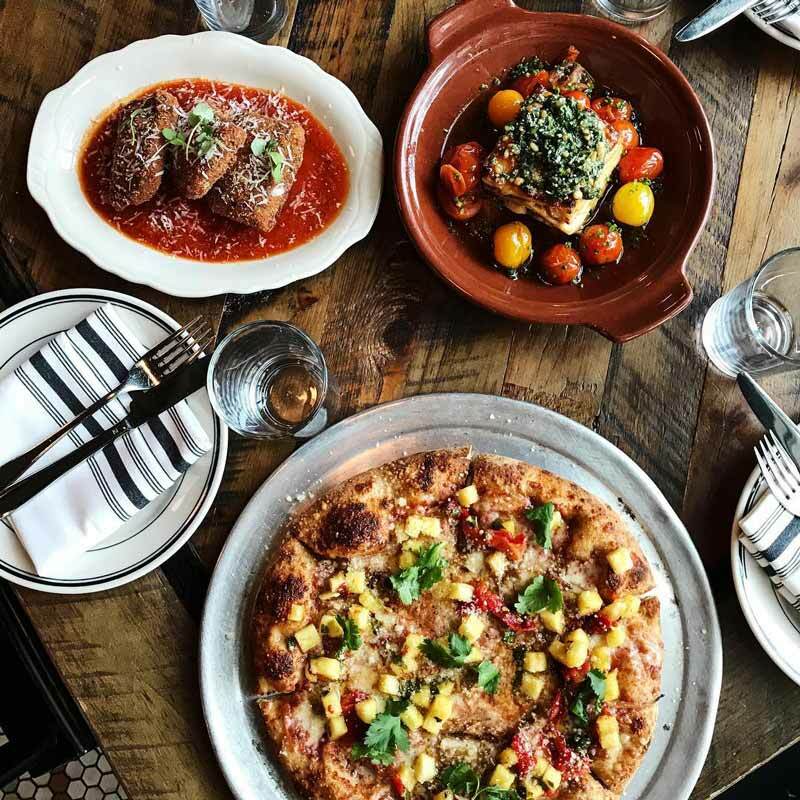 Located inside CityCenterDC, Centrolina is part food market, part restaurant, home to the mastery of RAMMY award-winning chef Amy Brandwein and her take on regional Italian cuisine. The small, yet thoughtful, seasonal menu relies on fresh local ingredients to transport diners on a culinary journey across the Italian peninsula. Expect pastas made in-house daily and wood-fired meat and fish. 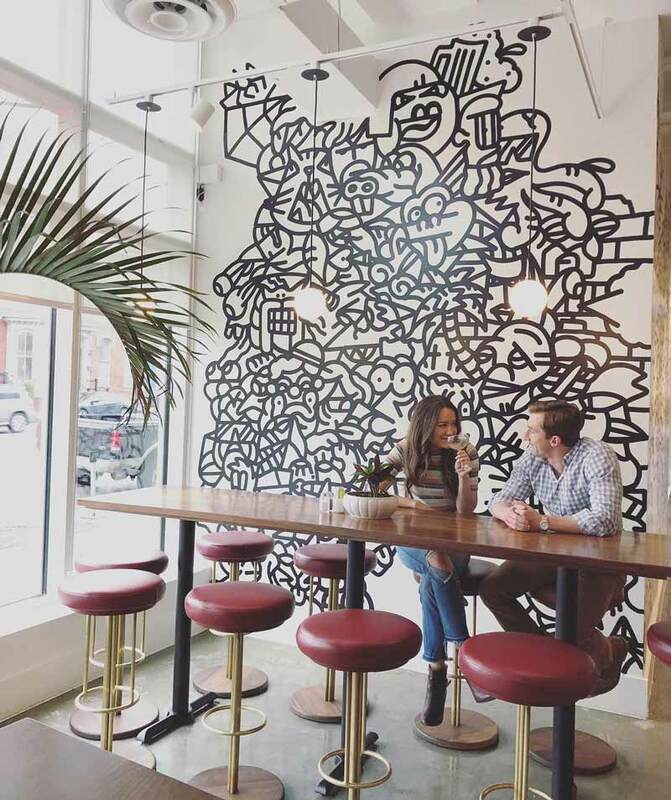 Ranked number four on Washingtonian’s 2016 list of the city’s best restaurants, Convivial gained a lot of buzz and managed to live up to the hype. Behind the chic hot spot is seasoned chef Cedric Maupillier, who honed his skills at Mintwood Place. This acclaimed eatery serves up forward-thinking French-American creations, like the fried chicken coq au vin., which has become one of the city’s most sought-after dishes. Regarded as one of the most stylish and exciting restaurants to open in recent years, the Michelin-starred Kinship – from Chef Eric Ziebold, who previously helmed the Mandarin Oriental’s Cityzen – features dishes that focus on technique, history, ingredient and communal preparations intended to be served family-style, like whole fish or 12-ounce ribeye cuts. Housed in the same building is Métier, an ambitious 36-seat restaurant with a seven-course tasting menu that earned it a Michelin star. Take note: advanced reservations are recommended and jackets are required for gentlemen. Okay, so award-winning chef José Andrès’ Jaleo is far from new, but this groundbreaking Spanish tapas restaurant is as popular as ever. 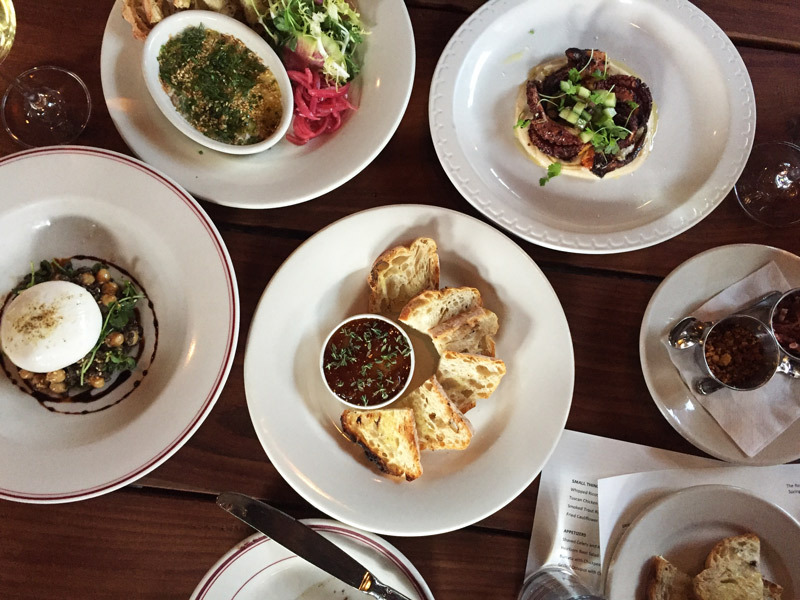 The accolades include Bib Gourmand honors in the DC Michelin Guide and being named “the best tapas restaurant this side of the Atlantic” by The Washington Post’s longtime food critic Tom Sietsema. 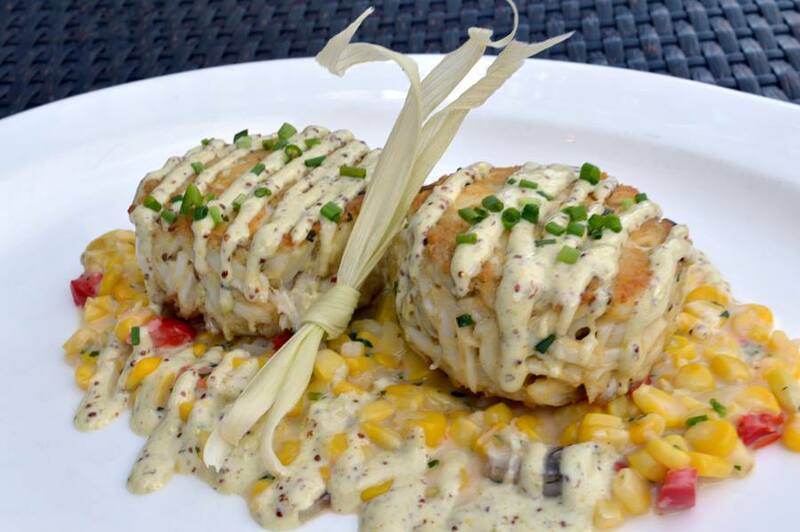 Safe to say, this culinary mainstay is a must-add to your post-convention dining to-do list. RAMMY award-winning pastry chef Tiffany MacIsaac has turned Buttercream Bakeshop into a local sensation, as scones, cupcakes, pies, cookies and more emerge freshly baked every morning. The shop also offers locally owned Compass Coffee to accompany its mouthwatering treats. Whether on the way to the convention center or taking a break from it, Buttercream is a great spot for satisfying your sweet tooth. Take a trip to the French Quarter when you visit Acadiana, known for its creative takes on New Orleans classics. Expect plenty of flavor, Louisiana culture and the welcoming allure of the southern region. The barbeque shrimp dish takes down-home to a whole new level, with the head-on shrimp served with garlic butter, black pepper and Worcestershire sauce. We’re on our way there already. James Beard Award-winning chef Fabio Trabocchi features Italian regional specialties at this Downtown locale. The soulful cuisine includes handmade pastas and a fantastic selection of Italian wines. Casa Luca was named one of DC’s 100 Very Best Restaurants by Washingtonian in 2015, and for good reason. It’s been wowing diners since opening its doors in 2013. 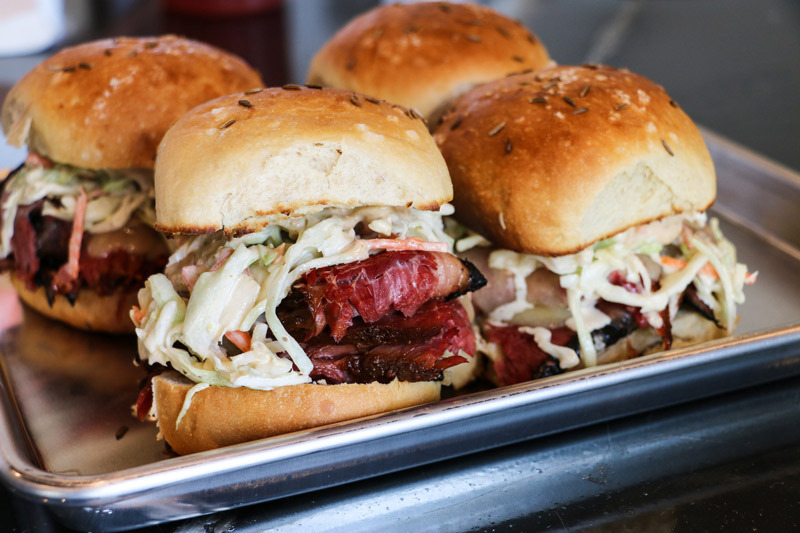 Smoked & Stacked is a labor of love for former Top Chef finalist Marjorie Meek-Bradley, who left her post as executive chef of Roofers Union and Ripple to focus on the popular sandwich shop located in Shaw, just steps from the convention enter. Filling what Meek-Bradley saw as a citywide void of pastrami and breakfast sandwiches, Smoked & Stacked wows patrons with favorites like The New Yorker breakfast sandwich, starring pastrami that’s been cured for eight days, smoked for five hours and topped with a fried egg, comte cheese and hot pepper jelly. A short walk from the convention center can bring you to Bolt Burgers, which serves up delicious Angus beef burgers, as well as chicken breasts and veggie burgers. Using all farm-fresh and local ingredients, Bolt Burgers makes for a fast, friendly and satisfying lunch or dinner experience. The restaurant also features large screen TVs and a 16-foot projection TV as well. A woodfire-powered kitchen, bucolic decor that emulates a countryside abode and an affordable, Italian-infused menu have turned The Red Hen into one of the city’s most popular neighborhood restaurants. Pasta lovers will have difficulty resisting dishes such mezze rigatoni with fennel sausage ragu or squid ink linguini, while those hankering for seafood can savor caramelized scallops or grilled swordfish. An exceptional wine list only adds to the tranquility.